Rounding significant figures is similar to rounding decimals except that the insignificant digits in the decimal places are replaced by zeroes. Learn to round off the decimals up to 5 significant figures, add, subtract, multiply and divide the decimals by rounding them off according to the significant figure rules and simplify the numerical expressions. Apply the concept of rounding significant figures to solve word problems. 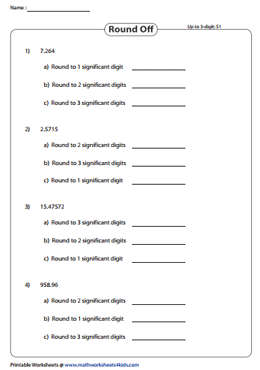 Each significant-figure-round-off worksheet consists of four decimals to be rounded off to one, two and three significant figures. The students are expected to apply the appropriate rules to round off. 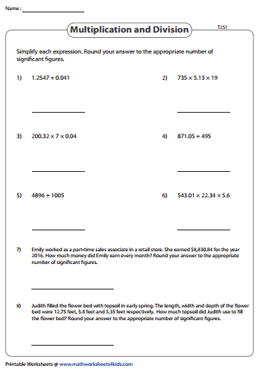 Enhance your rounding off skills with these round-up-to-5-significant-figures worksheets. 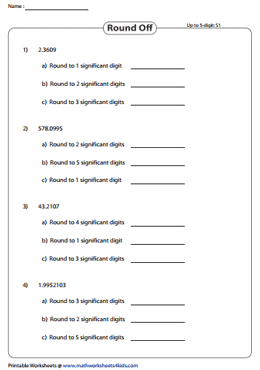 Round off each decimal to the specified number of significant digits using the standard round off significant figure rules. Count the decimal places in each number and find the least. Determine the sum or difference of two decimals and round it to the least number of decimal places. 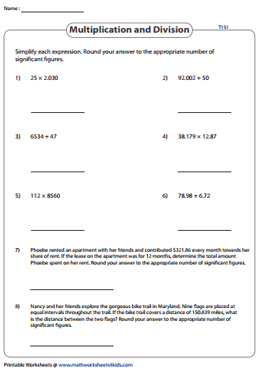 Two real-life word problems have been included in each worksheet. 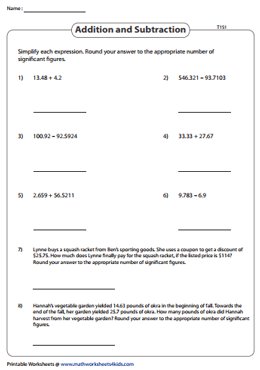 Reiterate the concept of adding and subtracting with these simplification worksheets. Improve skills with an increased number of terms to be added or subtracted, round off by applying apt significant figure rules. Perform multiplication or division to simplify each numerical expression presented in these worksheets. Identify the least number of significant digits in each decimal number and round off the answer accordingly. Determine the product or quotient and round it off to the least number of significant figures in these simplification worksheets involving multiplication and division.